The internet blew up this week as two llamas busted loose in Arizona. The full-on Llama Drama reached an almost OJ-Bronco-chase fever pitch complete with memes and near llama hysteria. With so many people jumping on the llama bandwagon, I feel it necessary to point out that I have been a llama enthusiast since I saw Dr. Doolittle. The first one. You know…back in the day. That’s just how cool I am. I was into llamas before they were the animal du jour, okay? I even had one of those inflatable pool toys with two llama heads ala Push-Me-Pull-You from the movie. Ask my husband; I’ve begged him for years to let me start an alpaca ranch. Husband: Why the hell would we want to raise alpacas? Husband: You don’t even knit. Husband: We’re not raising alpacas and we’re not getting a llama. You’re out of your mind. He’s not wrong. I am kinda nuts. But before the dream died, I spent some time considering possible names for my possible long-necked, shaggy, hissy friends. And now that llamas have found a mass audience, I think we can all benefit from what I came up with. There’s something for every llama lover out there. Linda Roy is a humorist, writer, musician living in New Jersey with her husband and two boys. Her blog elleroy was here is a mix of humor and music she refers to as "funny with a soundtrack". She is Managing Partner and Editor-in-Chief at the politics & pop culture website Lefty Pop and was named one of BlogHer's Voices of the Year for 2014. Her work has appeared at The Huffington Post, Scary Mommy, In the Powder Room, Aiming Low, Funny Not Slutty, Erma Bombeck Writer's Workshop, Midlife Boulevard, Mamapedia, Sprocket Ink, The Weeklings, and BonBon Break. She's the female Larry David, and will criticize your parallel parking to prove it. When she's not snarking and kvetching, she's fronting the Indie/Americana band Jehova Waitresses. My favorite is Llama Rama Ding Dong. Osama Bin Llama . . . snicker! Guffaw! 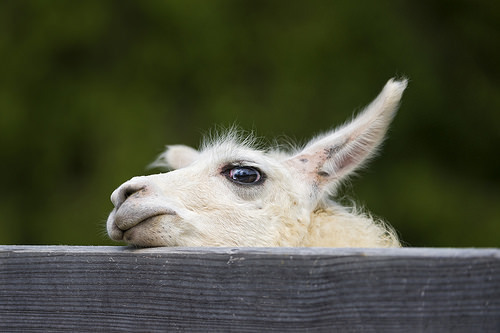 Sorry to rain on your parade, but both llamas and alpacas spit. Yes. Spit. Take it from someone who knows. Great list. I love it. I’d like to nominate one addition: Fernando Llamas (Lorenzo’s dad), Latin actor who looked marvelous, as Billy Crystal always said. A cute little fuzzy face AND a Superb clever/cute name?! My world just got larger . . .
Llama Rama Ding Dong rocks, as do the rest of these. I’m a BIG fan of Linda’s. Everything she writes is funny. And clever. I wonder if her Joisey edge has anything to do with it … No matter, keep ’em coming, Linda. Beth, thank you for the lovely comment! You made my day. And I think you’re onto something about Joisey. It’s quite possible it’s had an effect on me. But foggedaboudit!